My son is a wee bit obsessed with emergencies right now, he plays paramedic or firefighter multiple times a day. Every car ride is a ride in a firetruck … well you get the picture. So I decided to use his enthusiasm for first aid at craft time! 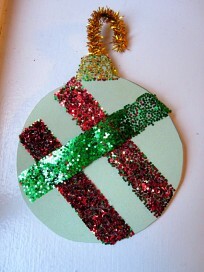 This is such an easy craft and I think they turned out perfectly ! I love the variation in textures with the smooth band aids and the soft fluffy gauze. Gather your materials. 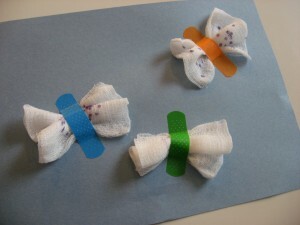 You will need some band aids, gauze pads, markers and a piece of construction paper ( or recycled cardboard ! ). 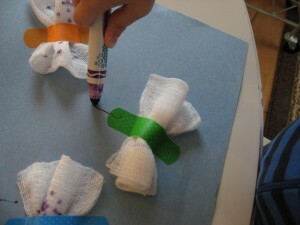 Start by decorating your butterfly wings ( the gauze) with a marker. 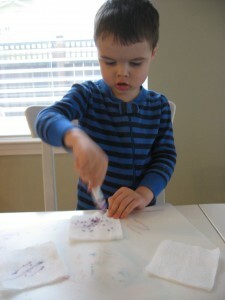 We found that dotting the marker works best so the gauze didn’t get all stretched out. 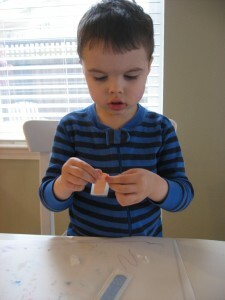 Open your band aids – this took a while but my son was very proud he did it independently. Next pinch the gauze, my son couldn’t do this step. Pop the band aids on. We did this step together . 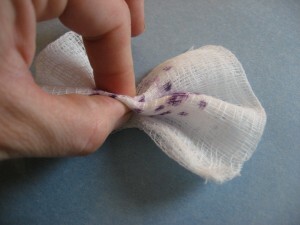 Add antennae with markers! I was so excited that he did this step, until now he would have had me do it insisting he couldn’t, both of us were proud that he did it with no help. 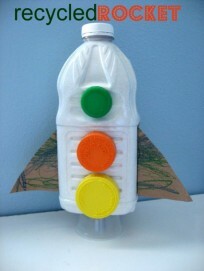 .-= Philippa´s last blog ..Paper Cup Penguin Puppet =-. You just always amaze me:) Too cute! 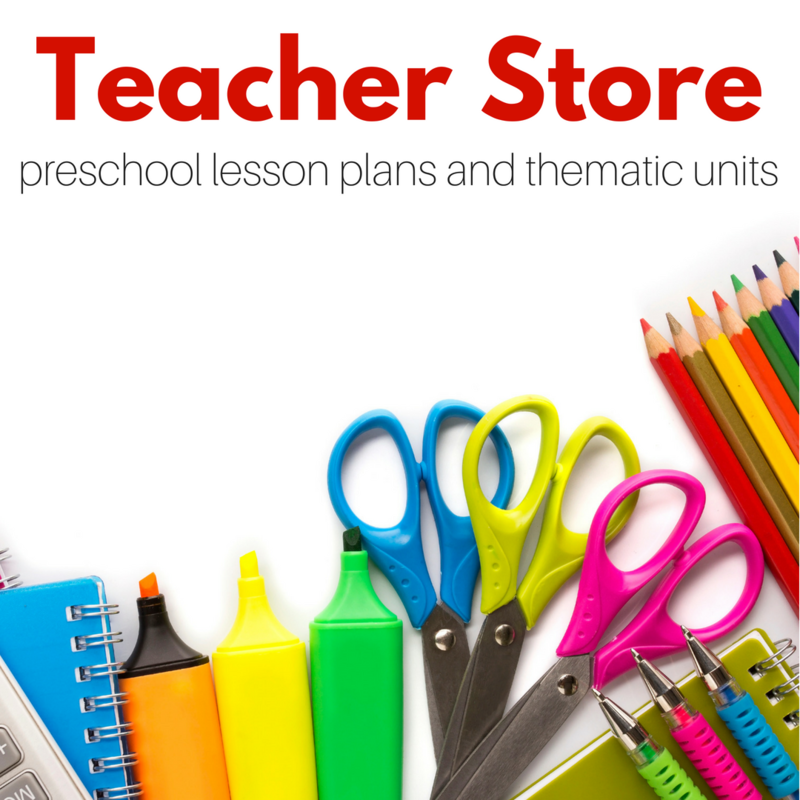 .-= Deborah´s last blog ..Morning greeting and calendar and weather time in preschool =-. Oh these are so cool! We’re talking about spring now so these will be making an apperance next week! Oh my word – this is adorable! We are going to HAVE to do these this weekend. I need some cool colored band aids, though. .-= Kim´s last blog ..Seventh Generation Review/Giveaway:CLOSED =-. .-= katherinemarie´s last blog ..Grocery Shopping =-. My girls are always trying to get into the bandaids! Your little butterflies are so clever. .-= Jen´s last blog ..SURPRISE! =-. What cool butterflies! My granddaughter is at the stage where she notices every little mark as a BIG boo boo. Can’t wait to make this our next craft project! 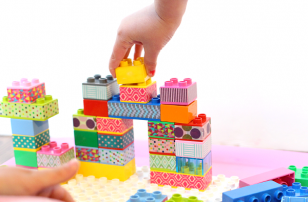 .-= Tina´s last blog ..The Batman Power Wheels Will Keep Your Little Crime Fighters Busy =-. 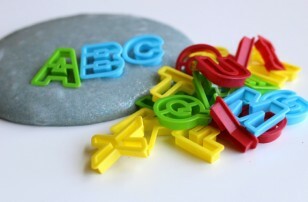 My girls love to do crafts and so I’m always looking for something new! 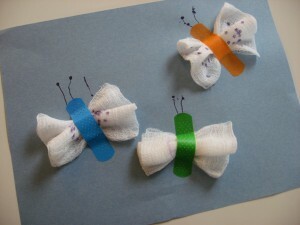 I’m going to try using the bandaid to attach the butterfly to a craft stick so that we can fly it around! Thanks for the inspiration! 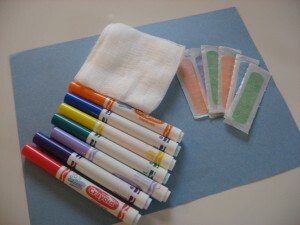 I linked to this on my Special Needs blog’s Facebook fanpage – this craft could really help kids who are in the hospital or are facing a hospitalization. Hospitals are full of new and strange smells and textures. 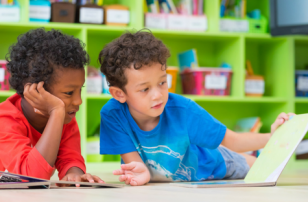 It’s recommended to use play to reduce children’s fear of the unknown. Every little bit helps. Perfect! I never even thought of that ! Fantastic , makes me very happy to hear ! Great for my seniors with dementia group. I will use tulle in different colors instead of guaze. These project will be a greeting card with stamped message. THANKS for a cute idea for my seniors!! What a cute idea! Great pictures also! .-= Bonni´s last blog ..Mom, stop whining!! Phil.2:14 =-. I love seeing creative projects like this! What a fun idea–thanks for sharing it. I think my daughter would really love this. We have a lot of extra band-aids since she is convinced that they will hurt her if we dare put one on her skin. Maybe this will help her get over her band-aid phobia! .-= vanessa @ silly eagle books´s last blog ..make your own bookplates =-. So cute and so simple! I love it – thanks for sharing! so easy and so perfect!thanks for sharing!I even could use idea at a work some time.